Ormonde Woman (shown above) was the first fragrance released by London-based niche house Ormonde Jayne, and features notes of cardamom, coriander, grass oil, black hemlock, violet, jasmine absolute, vetiver, cedar, amber and sandalwood. If you are wondering what black hemlock is, see here. 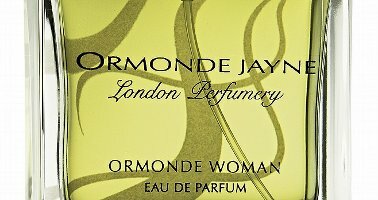 Of all of the Ormonde Jayne fragrances I have reviewed so far, Ormonde Woman is the hardest to capture in words. It is perhaps even more unusual than Champaca, although I would venture to guess that Ormonde has a wider audience. The top notes are very spicy and rich, slightly sweet, and almost foody. As the spices calm, the grass oil lends a green, almost herbal edge to the woods and the earthiness of the vetiver. Ormonde Woman is a complex fragrance, and not easily categorized. It is very smooth, and almost imperceptibly powdery. The wood notes are deep, but are balanced by the florals. The violet weaves in and out, adding a bit of lightness to what is otherwise a dark, rather mysterious fragrance. There is something very intense about it, but it is not in the least heavy. Ormonde Woman is, simply put, not me, but as with Champaca, there is something extraordinarily compelling about it, and if the US dollar would only recover — please! — a bottle would be mine. I do wish I could do a better job of describing it, but I can only throw my hands up in despair and suggest that you try it yourself, if you haven’t already. Ormonde Man was released more recently, and has notes of juniper berry, bergamot, pink pepper, cardamom, coriander seeds, oudh, black hemlock, vetiver, cedar, sandalwood and musk. The Ormonde Man is relatively transparent, and the spices stand out more over the bergamot than they do over the rich notes of the women’s fragrance. It is heavier on the pepper and juniper berry than the coriander and cardamom, and the floral notes are replaced by oudh, making this a deeper, more concentrated wood scent, with less sweetness. In some ways this one suits me better than the women’s, but it is more overtly masculine. Ormonde Jayne Ormonde Woman is available in 50 ml Parfum or 50 ml Eau de Parfum; the Ormonde Man is in 50 ml Eau de Parfum. For buying information, see the listing for Ormonde Jayne under Perfume Houses. Morning R! I love Ormonde but this was not love at first sniff. I started loving this after trying it a few times. Ormonde is indeed very smooth yet very deep. This is one fragrance where I have also received most compliments because it is so unusual. It is always a pleasure for me to introduce OJ to people here in Paris. Ormonde is Linda's masterpiece. It has no peers anywhere. Good weekend, R and everyone! Hi R – Out of all the OJs this one was my least favorite. I still think it is exquisitely unique but it smells meaty on me with a distinct celery note. My pups love it Blame it on my quirky chemistry!!! Thank heavens there are a few that don't work or I would be broke. Loving your series and am amazed by your continued creativity and 'freshness'. I look forward to your next article. Chemistry is a curious thing……this scent smells divine on me. But my friend tried it, and it literally smelled like piss on her! It was astonishing how it smelled like a completely different, er, substance! N, if you happen through again, I am very curious as to how well known the line is in France? Just in case you’d be interested, OJ is well known and loved among Croatia’s capital, Zagreb perfumistas. Many women come to a couple of shops specialized in niche perfumery and ask about the line frequently. Not all of them travel abroad often to be able to get to one of just 30 sales points where OJ is sold in the world and OJ is not the stuff found in airport duty frees, but once they try it, the search begins. It’s one of the better known brands among frag lovers, in spite of its inavailability in this part of Europe. .
And a good weekend to you L! I know it is her masterpiece, and it is my own failing that it isn't my favorite of the line. Still my all time favorite fragrance. It smells like my ideal of what exactly it is I want in a fragrance: woodsy, green, but deep and spicy, without ever smelling like a Christmas tree or a church or an oven full of cookies. It's its own scent entirely, which few fragrances ever manage. And it lasts forever, honestly: the coats I wear on days when I wear Ormonde still smell of it weeks later. I haven't sniffed Ormonde, but it sounds similar in its brilliant originality and complexity to Tolu. I've fallen in love with my Tolu sample. The notes sound so “not me,” but I find myself addicted to the resinous warmth and the bright citrus accord overlaid on a bed of soft incense. I don't even mind the amber on the drydown since it's tempered by the sweetness of the tolu and smokiness of the frankincense. On paper, these notes sound jarring together, but they blend beautifully to create a masterful oriental. Definitely bottle worthy. Hi R! I have introduced OJ to many of my friends here – however some were not totally impressed. Then there are some who have loved some of her creations – I do get asked what I am wearing and when I tell people Ormonde Jayne a wonderful English perfumer – they all look blank! If you ask an average French person even about SL, FM and IUNX they most likely will not know these houses – so OJ still has a long way to go to get known here and let us admit it is not a French brand and therefore “foreign”! Thanks N. I've been told (maybe by you?) that the French don't usually care for perfumes made by “foreigners”. These are so special that I would think they would impress anyone. Her perfumes really do have extraordinary lasting power. Osmanthus lasts through the next day, which is odd considering the relatively light notes. Ok, you've convinced me, I need to give Tolu another try. It was so “not me” when I first tried it that I passed the sample on to someone else almost immediately. Ormonde is the fragrance I wish I had bought instead of Tolu. It is beautiful, understated elegance. Thank you for this series, last night I took out my bottle of Frangipani and fell in love all over again. Lovely perfumes aside (and your series will result in me expanding beyond Ta'if *sigh*), I continue to be astonished by your ability to describe. Even when you throw up your hands in frustration you've done a wonderful job! *continues tutorial on fragrance writing at knee of master* thanks, Robin. Yes, elegant is the perfect word! And so glad you've enjoyed OJ week, so did I. I don't usually wear them all in the same week, and it was interesting to do. M, thanks as always for the nice words. I loved the interview on your blog today!! V, I don't adore it like I do the others, but I admire it. Sampaquita is another one that I need to revisit. I received a sample of Ormonde with my recent Ta'if order (the Ta'if is *gorgeous, BTW), and this one captured my heart. It's so complex, I cannot even begin to describe it, except to say that it reminds me of sinking into swathes of lush, plush blue velvet. It's simply stunning. This is definitely on my wishlist and (mumbling) I almost wish that I would have ordered Ormonde instead. Well, I'm glad you do love the Ta'if, anyway! Velvet is a perfect description of Ormonde. I see that no one has posted about this one for quite some time now. I've been bad, very bad, and very gutsy too. I am in fact biting my nails in between keystrokes. Why you ask? Well…I ordered this yesterday UNSNIFFED based upon the multitude of good ratings from MUA. And I see like most other unsniffed gambles, this could be a hit or an expensive miss. Butterflies in the tummy! Will keep my fingers crossed for you, hope you love it! I purchased the sample set recently, as part of a similar 'unsniffed gamble', and have been enjoying testing each scent out each day. My faves so far are Ormonde Woman and Ta'if, but i have a few more to try still – frangipani being one of them….can't wait. Thank you to this blog, I have discovered a hidden treasure in my hometown, and i will visit the OJ store to stock-up on some christmas pressies. So glad you're finding some you like, and very jealous that you're near the store — I'd love to go there! Funny, I just recd my sample set two days ago and I, too, am going through a scent a day. So far: Ormonde Woman, 10; Isfahan, 9; Taif… waiting for more developments. A jewel of a case and well worth the 35 quid (plus-plus). Many thanks for the excellent input and advice from “R” and everyone. Thought I was alone with my curious nose–not so! Happy Thanksgiving to US audience. Hey, you got a 10 already, excellent! You know, I have been doing a lot of serious sampling recently, being a new perfumista and all. Out of all the ones tested, I purchased three full bottles of the scents I loved the most. And out of those three, the only one I cannot live without and that i KNOW will always have a place on my dressing table, is Ormonde Woman. I have the EdP version, and when it runs dry i will invest in the pure Parfum. It is THAT worth it! Not only because it is beautifully made and absolutely exquisite – but because it is so hard to categorise, and so utterly unique. Truly, nothing else smells like this. It's also so versatile. It's my perfect 'date' scent! It is smooth and sweet enough to be warm and inviting, yet also dark and intense enough to be mysterious and captivating! it's nice to have found one fragrance that I feel this passionately about possessing – so far! I'm finding a few Serge Lutens scents are growing on me similarly…….Muscs Koublai Kahn repelled me at first, and now I practically drink it from my sample vial. I'm not sure I'd wear that on a first date though………!!! How nice! What were your other 2 full bottles? I definitely tend towards sultry, skanky, heavier frags – my samples of Cuir Mauresque and MKK just ran out and I am feeling their loss. The thing is – they tend to be more autumn/winter appropriate frags. So I am searching for great spring/summer scents right now that will appeal to my tastes. I'm checking out Les Nez and CB, and I ordered samples of Fleurs D'Oranger and Gris Clair from Les Sentuers. I reckon some CdeG would be good for summer too. Maybe even Mandragore EdP…….Hmmmmmm. It is all really lots of fun! God knows if i'll need to buy any full bottles, all these samplers will probably last me until autumn……. Nice choices, and so glad you're having fun! I finally ordered the samples set from OJ which I received last week. I’ve been trying a different sample every day and today was the turn of Ormonde Woman. Wow, what an original fragrance. I think that the notes I pick out the most are the violets, the hemlock (at lest I’m assuming that’s what it is) and the amber and together they remind me of freshly crushed cedar leaves. In a good way – green woody yet sweet. To me it’s a fragrance that would be perfect for crisp, bright autumn days. It’s fresh and warming at the same time. I’m not sure I’d buy a whole bottle but I wouldn’t be disappointed if I were given it as a gift and I certainly will use up my sample happily. So glad you’re enjoying the samples! Is the Ormonde your favorite of the bunch? I’m yet to try Tolu, Orris or the masculines but so far Ta’if and Frangipani are my favourites (as expected, I’m definitely into florals), with Ormonde, Champaca and Sampaquita fighting for the third place. Osmanthus was disappointment simply because it turned into that sharp, sweaty grapefruit on my skin within the first 30 mins and then disappeared completely. Shame as it was nice enough to begin with. You’re right…they aren’t weirdo perfumista-only niche scents. Osmanthus must do that to lots of people — I love it, but many people don’t. Ta’if and Frangipani are favorites of mine too though, and adore Champaca. I think this might be instant love : dark inky green, warm and mysterious, spicy moss, dark green velvet…others describe it so much better. Wonderful stuff. After 2 years sniffing, I feel like I have suddenly discovered PERFUME! Yeah, I have enough bottles to last a decade, but why? Okay, I know I”ll want a change after a couple of days in this but at the moment everything else seems like a poor shadow. MUST HAVE A BOTTLE. Ormonde Woman was a landmark in my forays into serious perfumania after I discovered the blogs, and the availability of samples and decants of practically everything. I ordered it in a kind of fever of anticipation. At first sniff, I was…appalled. I thought it was weird, dreadful, certainly not for me. Six months later, I retrieved the despised vial from a drawer, and felt only wonder at the beauty and mystery of the scent. I get something sort of medicinal from it, and I guess that aspect was what shocked me initially. But I love it and am contemplating a bottle of the pure perfume. I agree, it is that marvellous. Wow, this is good stuff. I wasn’t all that impressed the first time, but last night I compared it with Tam Dao by Diptyque, which I really enjoy, thinking to see how two ‘woodsy’ scents compared. What a difference! I hadn’t been able to appreciate the Ormonde properly until then. Diptyque, while very pleasant, is pretty much straight-up cedar. I like it, but Luca and Turin have a point when they say it’s more of a pretty smell than a perfume. Ormonde, though, is perfume through and through: a little heavier, a little sweeter, and far more complex and beautiful. I wish I could afford a full bottle.